Peter and I could hear the swoosh of our ocean sensors breaching the surface like a whale taking a deep breath before s/he dives down again. Only after the “swoosh” did we see the yellow, blue, and red tones of the sensor packet bobbing at the surface. We had failed for more than 20 minutes to receive any signals from the instruments that were supposed to respond to our queries to wake up. In despair and with some blind trust that we had woken up our instruments, I sent the order to release into the void of the ocean, that is, I commanded a small motor to turn a steel pin that connects two yellow buoys and red/blue instruments to a 500-pound iron anchor. Once released, the yellow floats carry electronics and data to the surface. The anchor stays behind and its iron provides, as it corrodes, a micronutrient needed for life in the ocean. The dust from the Sahara works the same way to distribute desert iron in the Atlantic Ocean. The “swoosh” told us that all had worked out well this day. 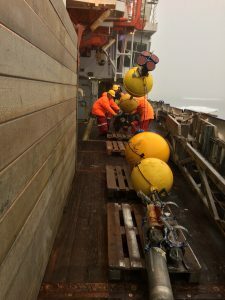 The current measuring devices were moored for a year at the bottom of the 400m deep and 50 km wide channel that acts as a conduit for warm Atlantic waters. These waters reach the glaciers of North-East Greenland where they melt them from below the surface, all year long. 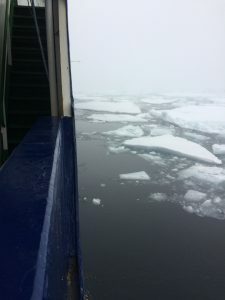 Several German, American, British, Canadian, and Swedish expeditions the last 5 years focused on how warm ocean waters melt glaciers all around Greenland (and Antarctica). 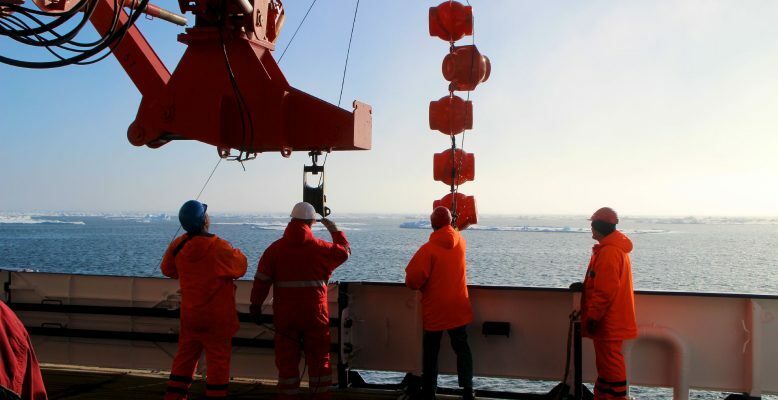 As glaciers melt, they become thinner and often move out to sea faster than they did before. As glaciers accelerate, they move more ice currently on land out to sea which raises global sea level. The melting of glaciers in Greenland contribute to the flooding that people in Texas, Florida, and Puerto Rico felt dearly the last weeks when massive hurricanes hit. My son living in Florida was among them. Hurricane winds are bad enough, but the surging seawater kills. The same winds that caused, say, 5 feet flooding in 1970 now cause 6 feet or more, because global sea level is that much higher today. So, what happens in Greenland does not stay in Greenland. We are all connected both as a people living within one climate system that impacts us all. Back to my “swooshing” ocean moorings. 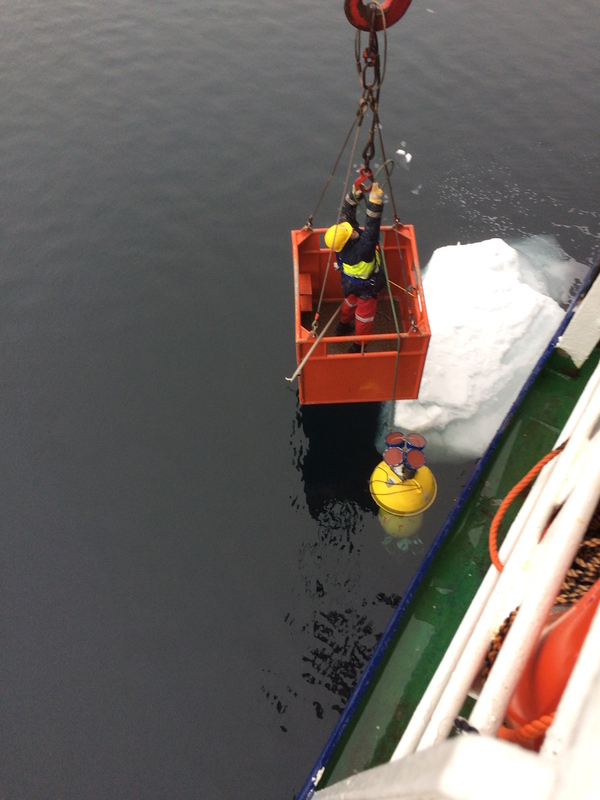 There were 2 such moorings that we recovered the days prior with a little luck and pluck. The first appeared within a few 100 meters of the glacier front bobbing at the surface. How it got there from the ocean floor 8 hours prior still remains a mystery: We never send a release command and both releases were still closed. It should still have been at the bottom, but it was not. The second recovery was without a swoosh in dense ice and fog. After releasing it from the bottom, we searched it for 20 minutes. Try to find it in this photo and imagine how it may have looked 5 minutes after it was “discovered” by Sebastian and Norbert.